May Isabel Hall was born on 6 August 1879 in Sandhurst (Bendigo), Victoria. She was the fourth of the five children and first daughter of John Pitchers Hall (c1836–92) and his wife Isabella Jane (c1845–1918), successful drapers of that city. May’s parents were both English immigrants to the young colony. According to their marriage certificate, her father was born in Cambridge and was likely the son of John Hall, a bricklayer and his wife Mary (nee Pitchers). Her mother’s parents, Thomas Spargo Nicholls (c1826-86) and Jane (nee Anderson) (c1805–97) had come to Victoria around 1851. They lived first in Melbourne and then Ballarat where Thomas, a carpenter by trade, became a builder. John Hall the younger and Isabella Nicholls married in Ballarat in 1872. They moved to Bendigo, then officially known as Sandhurst, in 1874. Their children were born in subsequent years: Harry in 1874, Thomas in 1876, Stanley in 1878, May in 1879 and Linda Jean in 1881. John and Isabella Hall established themselves in the prosperous city with two drapery stores. Isabella particularly was involved in the local church and community (Bendigo Advertiser, 9.5.1918). Her interests encompassed their local Forest Street Methodist Church with its myriad social and philanthropic activities, as well as the local branches of the Young Women’s Christian Association, the Australian Women’s National League and the Women’s Literary Society where she debated. She supported for votes for women – her signature ‘I J Hall Sandhurst’ can be found among the 33,000 names on Victoria’s Women’s Suffrage Petition in 1891 (the so-called ‘Monster Petition’) (www.parliament.vic.gov.au/static/WomensPetition/pdfs/731.pdf). Mrs Hall was regarded as an astute business woman throughout her life, maintaining the family firm after her husband’s death in 1892 until sons Harry and Stanley took it over. May was clearly raised in a forward-thinking household. John Hall’s will stipulated his widow continue the business and hold his personal estate (over £2,200) in trust for their children until they reached adulthood. The estate was divided equally among sons and daughters, and any could make an early claim on the funds ‘for his or her benefit or advancement in life’. Likewise, the children’s maternal grandmother left her estate to be equally divided between them (Will of John Pitcher Hall, Will of Jane Nicholls, Public Records Office of Victoria). In this context, it is not surprising that the Halls sent both May and Jean to Girton College in Bendigo for at least part of their education. Girton was 'a select school for the daughters of wealthy parents' (Keith Cole, Through Harship to the Stars: The centenary history of Girton College, Bendigo 1884-1984, p.29). Named deliberately after the first college for women at Cambridge, the school prepared girls for university matriculation and encouraged them to train for careers. The sisters won various prizes and Jean in particular distinguished herself through her musical talents. She matriculated for the Melbourne Conservatorium, won a valuable exhibition and passed examinations conducted by the Royal Colleges of Music (Bendigo Advertiser, 1.3.1905). She became a music teacher at her old school Girton and in Melbourne. Bendigo's prosperity suffered severely in the from the late 1880s with the decline in mining. As was the situation in many families of the day, John and Isabella’s children left the place of their upbringing to make their lives and fortune elsewhere. Harry and Thomas went to Western Australia, where their relative James Spargo Nicholls was a successful newspaper printer. Jean divided her time between Melbourne and Bendigo, teaching music students in both places. May moved to Melbourne to train as a nurse at the Children’s Hospital, perhaps inspired by her mother’s interest in social issues. She completed her training and registration for the Victorian Trained Nurses Association in 1906. According to the information on her service record, she was a theatre nurse at the Children’s Hospital, and then spent three years as a staff nurse at ‘Mr Bird’s private hospital’. This hospital, located at 41 Spring Street, Melbourne was run by well-known surgeon Frederic (‘Fred’) Dougan Bird, MB BS, FRCS (W. D. Upjohn, 'Bird, Frederic Dougan (1858–1929)', Australian Dictionary of Biography, National Centre of Biography, Australian National University, http://adb.anu.edu.au/biography/bird-frederic-dougan-5239/text8821, accessed 29 January 2014). She was listed with the nurses’ home/employment agency Winfield at 340 Albert Street, East Melbourne and presumably like most nurses of the time, took care of the sick in their own homes. 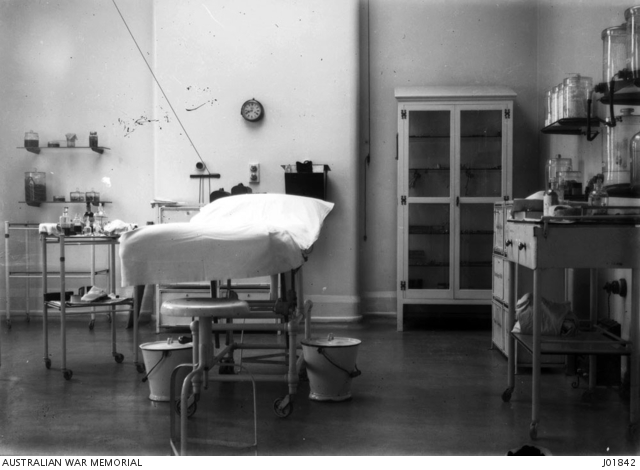 Working in this progressive surgical hospital was the likely impetus behind May’s decision to enlist in the Australian Army Nursing Service (AANS). Mr Bird was appointed honorary surgeon to the first expeditionary force and sailed for Egypt on the ‘Orvieto’ in October 1914 with senior army medical officers. Four unnamed nurses from his hospital accompanied him, they like him initially in a private capacity (Argus, 28.8.1914, 5.5.1916). May’s application to join the AANS is dated 10 May 1915, in the midst of the disastrous Gallipoli campaign. She had little time to gather her uniform and kit, as she left Melbourne for Egypt on the ‘Mooltan’ a week later, on 18 May with the large contingent of medical officers, nurses, and other ranks of the 3 Australian General Hospital. May was the first of two siblings to join up. Stanley Anderson, her brother, enlisted several months later, and was not sent overseas until April 1916. The entries on May Hall’s service record contain gaps. In 1915, she served on the island of Lemnos where sick and wounded from the disastrous Gallipoli campaign were treated under the most difficult of circumstances. The story of 3 AGH on Lemnos, with the privations of equipment, food and most basic comforts, is now becoming well known. May’s own (filtered) experiences are recorded in a letter to her mother written from the island in August 1915 appeared in the Bendigo press (Bendigo Advertiser, 8.10.1915). Coming from a local woman ‘as close to the front as nurses are allowed’, it must have made a powerful impact on its readers, as much for its references to strict censorship imposed as for its direct information about for example the noise of gunfire. She wrote ‘“by electric torch on a chair outside my tent”’. The weather was very hot, which prompted May and others to ignore health warnings about the water to enjoy the ‘”one luxury … sea bathing”’. The enormity of the tasks confronting May Hall and her fellow nurses was apparent from her request for ‘”pyjamas by the thousand … any amount of washers …”’ and reading matter for the wounded, ‘”something to take their thoughts off their awful experiences …”’ Making contact with old friends who arrived on the island was well nigh impossible, let alone learning the names of the wounded. With the evacuation of troops from the Gallipoli Peninsula at the end of 1915, 3 AGH was no longer required on Lemnos and transferred to Egypt. May Hall reached Alexandria late in January 1916. 3AGH moved to Abbassia outside of Cairo, awaiting its next move as the fighting moved north to the Western Front. May Hall appears to have spent much of the year 1916 on ships to Australia which were transporting troops who had long-term illnesses or wounds or who were permanently unfit (‘boarded’) – on the SS ‘Clan McGillivary’, then back to England on SS ‘Ceramic’, former luxury ocean liners converted into troop carriers. It was perilous work. In his contemporary history of the Australian Army Medical Corps in Egypt, James Barrett commented ‘There is no more dangerous branch of medical service than the transport of sick and wounded over the ocean, since there are so many possibilities of disaster.’ (http://www.gutenberg.org/files/41911/41911-h/41911-h.htm#Page_67). May was back in England about November 1916. She returned to 3AGH, which was at that time temporarily installed at the Kitchener Military Hospital in Brighton. She had two periods of a fortnight’s leave, presumably as matrons attempted to meet leave entitlements before the unit headed to the front again. Nursing in the formidable structure that was formerly the Brighton workhouse cannot have been easy (see www.awm.gov.au/collection/P07908.003). Hall and her fellow nurses looked after wounded troops from the Somme. Some were “very difficult” cases and the work was “very hard” according to nurses there (Bassett, Guns and Brooches, p.58). The nurses’ living conditions were also difficult. The nurses were quartered in a nearby school where they were “fearfully cold”. After several months with 3AGH at Kitchener and 2 Australian Auxiliary Hospital in Dartford, May Hall was posted to France in April 1917 where she was to spent nearly eight months. She was briefly with 1AGH in May and June. The hospital was one of several on the race course at Rouen. For months its staff had dealt with the onslaught of casualties from the Somme, in appalling conditions during the notorious ‘Somme winter’ of 1916-17. May was posted for duty there as summer approached. The pressure on the medical officers (around 23) and nurses (90) had been significantly reduced, and the hospital was generally only around two thirds full. Much work revolved around preparing patients for evacuation to hospitals in England. (1 AGH, War Diary, AWM). In June 1917, May was transferred and promoted to Sister with 2 AGH, located at Wimereux near Boulogne. 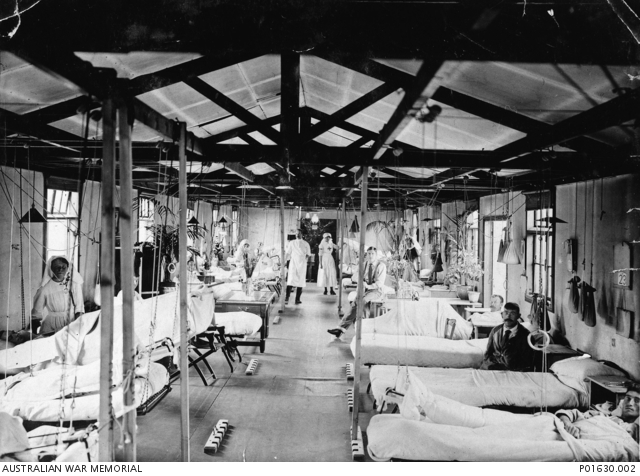 A hutted hospital, 2 AGH treated battle casualties including fractures and gas poisoning with up-to-date treatment methods. Unlike 1 AGH many of the patients remained for months. During Hall’s time there, the hospital experienced a number of air raids. (Jan Bassett, Guns and Brooches: Australian Army Nursing from the Boer War to the Gulf War, 1992, p. 57; Kirsty Harris, More than Bombs and Bandages: Australian Army nurses at work in World War 1, 2011, p.160 passim). In late 1917, May Hall’s mother was seriously ill and her family anxiously enquired of the army the quickest way to contact her. May returned to Australia on transport duty on HMAT54, the ‘Runic’. Her mother secured the one and only ticket to greet her daughter when she disembarked. Mother and daughter returned to Bendigo, where May nursed her mother. May was also an honoured if almost silent guest at rallies in her home town for the Australian Comforts Fund (Bendigonian, 21.3.1918) and the Red Cross (Bendigonian, 18.4.1918). Despite her first hand experience of nursing sick and wounded men at ‘the front’ and in England, she was overshadowed on both occasions by dignitaries without first-hand experience comparable to hers, first the mayor of Bendigo and then Lady Helen Munro Ferguson, wife of the Governor General and founder of the Australian Red Cross. When Sister Hall did speak after accepting flowers, ‘she made a characteristically modest response.’ (Bendigonian, 21.3.1918). May’s mother Isabella died on 14 May 1918. In her will, she left May and Jean, her single daughters, £100 each over and above the equal share of her estate between her five children. She also left May £3 per week for ‘each week in the period during which she shall have attended and nursed me during my illness’ (Will of Isabella J Hall, Public Records Office of Victoria). May remained in Australia for the remainder of 1918. She was discharged from the AANS on 30 October 1918, shortly before the Armistice was declared. She subsequently claimed 7 months duty on ‘Home Service’, very likely in Caulfield Military Hospital (11 AGH) in 1918 and 1919. May Hall rejoined the AANS in August 1919 and was found fit for active service by the pioneering Melbourne doctor Lilian Alexander. She declared herself 38 though she was in fact 40, and Church of England despite her Methodist upbringing. This time May was dispatched on ‘special service’, nursing duties on board the SS ‘Rugia’ travelling from Sydney to Rotterdam and London in October 1919. The ship was formerly of the Hamburg Line but was now part of the spoils of Allied victory. The passengers were German internees held in Australian camps during the war. Some were titled, such as Baroness von Forckenbeck, but country newspapers described the deportees as including ‘notorious criminals who have been collected from the civil gaols’ (Daily Observer [Tamworth], 15.10.1919). Voyages such as this typically carried internees (this time nearly 300 men, women and children), guards, and a small medical staff. Not least among the dangers of travel at this time was the prevalence and severity of the influenza epidemic. SS ‘Rugia’ reached London shortly before Christmas 1919. May was granted six months leave without pay pending her discharge in the United Kingdom. Her file records ‘NME’ (non-military employment) which may have been additional nursing training or perhaps a visit to her sister Jean who may have gone to study music in England or Ireland. She returned to Australia on the SS ‘Honorata’ in June 1920, as head sister on the troop carrier. May Hall was discharged from the AANS on 6 October 1920. She does not appear on the electoral rolls in the 1920s, but from the 1930s until the 1960s is shown as a nurse living in South Yarra and Toorak. She worked with the Victorian Bush Nursing Association for a time and then like many other WW1 nurses, moved into Victoria's booming infant welfare movement. In c1922, she was the Sister at the Baby Health Centre in Kensington Town Hall, and from there she established an outreach clinic in Moonee Ponds in January 1923. 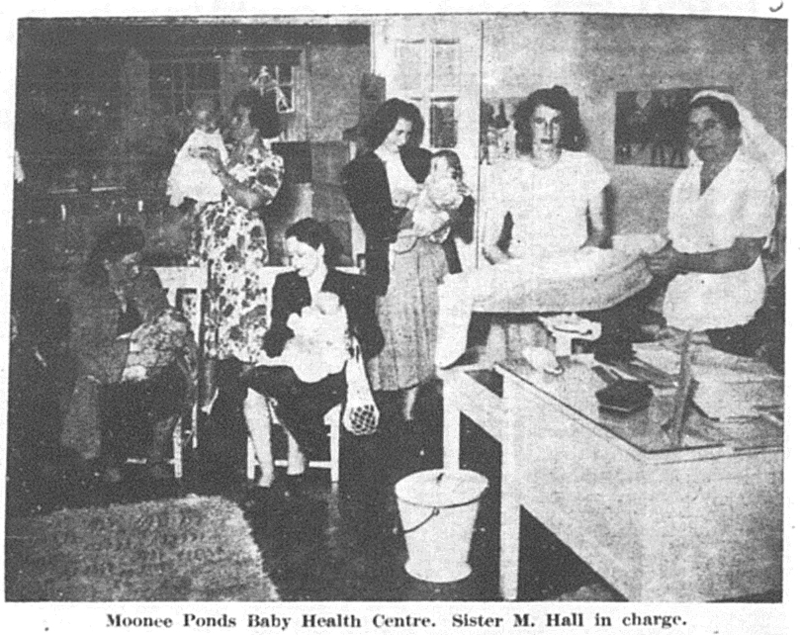 She worked as Essendon Council's Baby Heath Centre Sister for 28 continuous years, until late 1955. She was 76 when she retired. In 1925, serious illness and extended convalescence prevented her from working for months; the Edith Cavell Trust which supported sick and needy army nurses provided her with £40 to help defray hospital, medical and living expenses. By the early 1960s, both her health and financial situation had deteriorated and although she had a small repatriation pension, she again sought and found 'a little help' from the Edith Cavell Trustees. Her final grant came towards the end of her life when she was a patient in Heidelberg Hospital (May I Hall, Application, Edith Cavell Trust Fund, M290, M291 NAA). Late in her life May Hall lived in the RSL residence for returned army nurses in Albion St, Balaclava. Her death took place on 30 May 1970 in nearby St Kilda East. She was 90. Her estate was valued at $2658 in cash, bank accounts and shares. She left small legacies to the RSL for the organisation's kindness of and care for her and to two friends, but the bulk to a niece in Perth, Verna Bussemaker. May Hall featured in the East Melbourne Historical Society's 2015 exhibition, 'Gone to War as Sister: East Melbourne Nurses in the Great War'. Her panel can be seen at https://emhs.org.au/system/files/catalogue/pdf.../cost_to_nurses_health_print_x-1a.pdf. Thanks to the Old Girtonians Association, to Military Museum Bendigo for the photo of the memorial plaque, and to Marilyn Kenny of the Essendon Historical Society for information about May Hall's employment with the Essendon Council, photograph and details of her latter years and death. Can you correct or provide more information about this person? Or are you able to help with this history project? Family stories and records including photos, documents and memorabilia? Stories or information in books, newspapers and on-line? 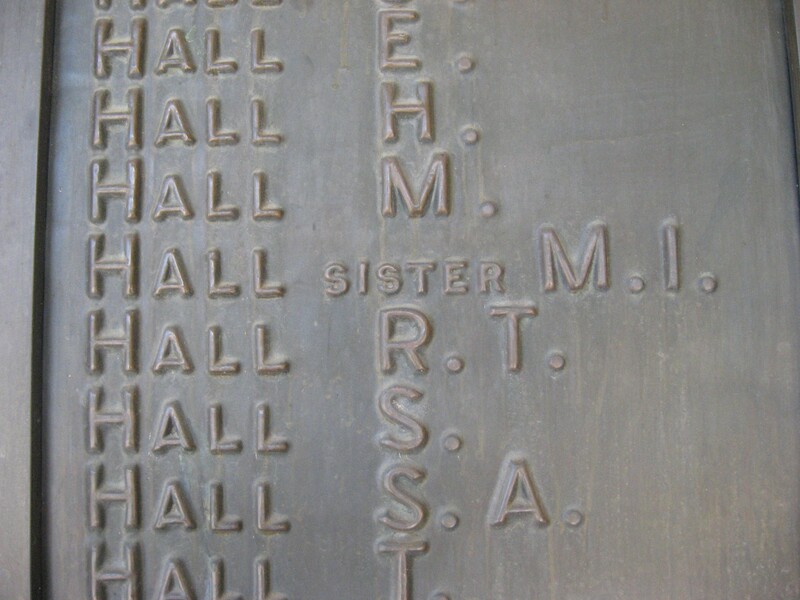 Memorial plaques in churches and public places? War memorial, church, national and state archives? If so, please Contact the East Melbourne Historical Society.